University of Lynchburg music education majors traveled to Richmond on Thursday, February 1, for Arts Advocacy Day. The annual event, sponsored by Virginians for the Arts, brings arts supporters from across Virginia together to meet with lawmakers about the importance of the arts to education, culture, and the economy of the Commonwealth. More specifically, the Lynchburg students — Thomas Cass ’20, Brianna Fleming ’20, Zerai Thornton ’20, and Chris Young ’20 — wanted to let members of the General Assembly know they oppose House Bill 1419. The bill concerns instructional time in Virginia’s public schools. Opponents fear it could reduce the amount of time devoted to the arts in elementary schools. While in Richmond, the LC students met with aides of Lynchburg-area Delegates T. Scott Garrett (R-Lynchburg) and Kathy Byron (R-Bedford) and Senators Steve Newman (R-Lynchburg) and Mark Peake (R-Lynchburg). Young believes their message was well received. The Lynchburg students also performed for lawmakers and members of the Virginia Music Educators Association during “Lights, Coffee, Action!” a breakfast meet-and-greet at Dominion Arts Center’s Carpenter Theatre. The students are members of the CoVMEA, which is the collegiate branch of the VMEA. Young is president of the CoVMEA and Cass is its western region representative. Music education majors (left to right) Brianna Fleming, Zerai Thornton, Thomas Cass, and Chris Young backstage at the Dominion Arts Center’s Carpenter Theatre in Richmond. 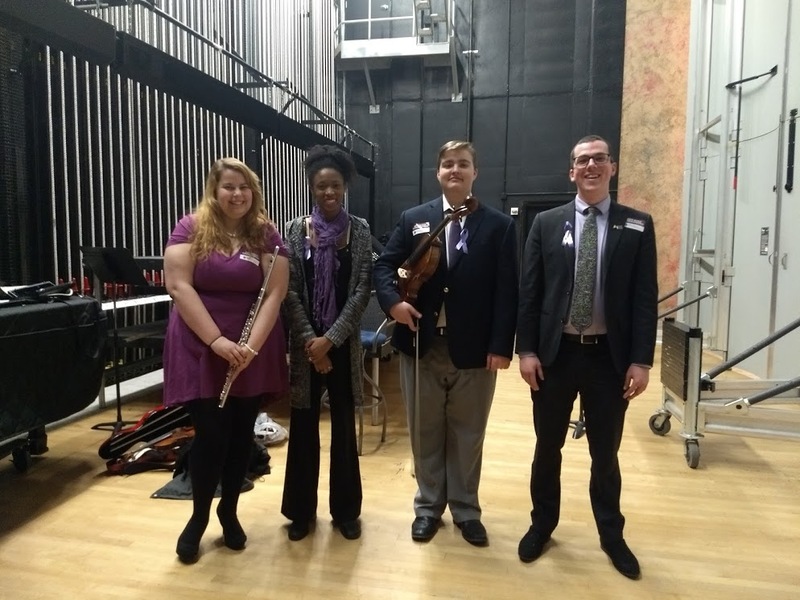 The students, all music education majors, performed for lawmakers and members of the Virginia Music Educators Association on Arts Advocacy Day.